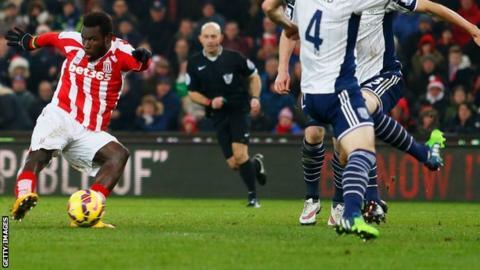 A brace from striker Mame Diouf gave Stoke victory at the Britannia Stadium and piled more pressure on West Brom manager Alan Irvine. It is a seventh loss in nine games for the Baggies, who are one point above the relegation zone, with Irvine saying before the match he feared for his job. Diouf swept home an Erik Pieters cross to open the scoring and deflected in a Marko Arnautovic shot for his second. Stoke move into the top half of the table with back-to-back victories. The Potters headed into the game following a 1-0 win over Everton on Boxing Day and manager Mark Hughes made just one change to the side as he sought consecutive victories for the first time this season. Stoke have claimed notable wins against Manchester City, Arsenal and Tottenham Hotspur but have failed to push on each time. With two games in three days, Peter Crouch came in for top scorer Jon Walters but the Baggies defence, whose costly mistakes had handed Manchester City a runaway lead in the 3-1 defeat at the Hawthorns on Friday, easily dealt with the aerial threat of the 6ft 7in striker. The Baggies, with four changes to that team, looked far more solid for large parts of the game and could have taken the lead when Brown Ideye fluffed a one-on-one with goalkeeper Asmir Begovic after Stoke's Glenn Whelan had an early penalty appeal turned down. There was not much to separate the sides before the break, with Stoke's best chance of the first half falling to the impressive Bojan Krkic, who shot narrowly wide from the edge of the box after combining with fellow Spaniard Marc Muniesa in midfield. Stoke eventually took the lead on 51 minutes when Diouf swept home from the centre of the box to claim his fifth goal of the season after full-back Pieters had picked him out with a cut-back from the left. With the Baggies desperate for points, Irvine made a double substitution on 63 minutes as Saido Berahino and Silvestre Varela replaced James Morrison and Stephane Sessegnon. Moments later Gareth McAuley hit the post after a goalmouth scramble. But that was as close as the Baggies came to a comeback as Diouf, who had gone eight games without a goal, added his second of the match when Arnautovic's hopeful shot hit the Senegal striker to deflect past a bemused Ben Foster. While Stoke end 2014 in the top half of the table, West Brom are hovering close to the relegation zone after taking four points from a possible 27. "It was a struggle for both teams to go again in the short space of time. It affected us in the first half as we were off the pace. The second half we had more energy in our play and we were more on the front foot and we got the first goal, which was crucial today. "If you are in right areas and you are a striker and you get touches, you reap the benefits. I was pleased for Mame Diouf. We have played him in various positions, but we played him down the middle and that is his best position. "I'm really pleased he has got on the goal-scoring sheet again and it is back-to-back clean sheets for us. "We are a team that can consistently be in the top half if we all do our jobs, and we want to stay there for the rest of the season." "Two deflected goals. When you are not getting the breaks, a lot of things go against you. We created chances in the first half, we hit the post at 1-0 and we perhaps had a chance to score before they scored. But as you say, when your luck is out, your luck's out. "We had enough chances but we didn't hit the target often enough. The nature and timing of the goals made it difficult for us. Without making mistakes we have ended up with a couple of cruel deflections that have made it difficult for Ben [Foster]. "Obviously it is up to other people [about my future]. All I can do is keep working as we do and we will see what happens. My immediate future is that I will be working on West Ham tomorrow. It's a big game and we need to get a good result. "We have good players in the dressing room and obviously I'm employed to work with those players and I'm happy to do that." Match ends, Stoke City 2, West Bromwich Albion 0. Second Half ends, Stoke City 2, West Bromwich Albion 0. Attempt missed. Silvestre Varela (West Bromwich Albion) right footed shot from outside the box is too high. Assisted by Chris Brunt. Attempt missed. Marko Arnautovic (Stoke City) right footed shot from outside the box misses to the left. Assisted by Mame Biram Diouf. Jonathan Walters (Stoke City) wins a free kick on the left wing. Foul by Andre Wisdom (West Bromwich Albion). Substitution, Stoke City. Marc Wilson replaces Glenn Whelan. Offside, Stoke City. Steven N'Zonzi tries a through ball, but Marko Arnautovic is caught offside. Substitution, West Bromwich Albion. Youssuf Mulumbu replaces Graham Dorrans. Gareth McAuley (West Bromwich Albion) wins a free kick on the right wing. Substitution, Stoke City. Charlie Adam replaces Bojan because of an injury. Silvestre Varela (West Bromwich Albion) wins a free kick in the defensive half. Chris Baird (West Bromwich Albion) is shown the yellow card for a bad foul. Marko Arnautovic (Stoke City) wins a free kick on the right wing. Foul by Chris Baird (West Bromwich Albion). Offside, Stoke City. Geoff Cameron tries a through ball, but Marko Arnautovic is caught offside. Foul by Silvestre Varela (West Bromwich Albion). Attempt missed. Geoff Cameron (Stoke City) header from the centre of the box is high and wide to the right. Assisted by Bojan with a cross following a corner. Corner, Stoke City. Conceded by Joleon Lescott. Attempt blocked. Steven N'Zonzi (Stoke City) right footed shot from outside the box is blocked. Assisted by Bojan. Goal! Stoke City 2, West Bromwich Albion 0. Mame Biram Diouf (Stoke City) right footed shot from the centre of the box to the bottom right corner. Assisted by Marko Arnautovic. Attempt blocked. Marko Arnautovic (Stoke City) right footed shot from outside the box is blocked. Assisted by Bojan.